We’re thrilled to announce the next Go and Write! 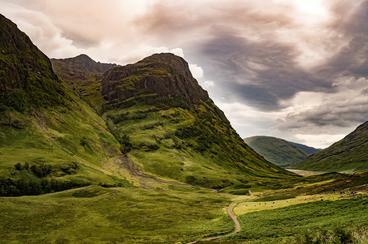 retreat will be held in Scotland this autumn, September 14-27. We’ve secured private use of Lunga House, a charming seaside castle. We’ll have full use of this beautiful, ancient estate for readings, workshops, and one-on-one meetings to discuss your individual writing projects. Then we’re off to the Scottish Highlands, venturing through beautiful Glencoe to Inverness, with tours of Loch Ness, Urquhart Castle, and sites such as the moving Culloden Battlefield and the standing stones at Clava Cairns, the inspiration for author Diana Gabaldon’s famous Outlander series. With a great balance of writing, sightseeing, and mingling with other like-minded souls, this 12-day Scottish literary adventure promises to be our best Go and Write! retreat yet. The first leg of our journey takes place in Lochgilphead, where our Go and Write! 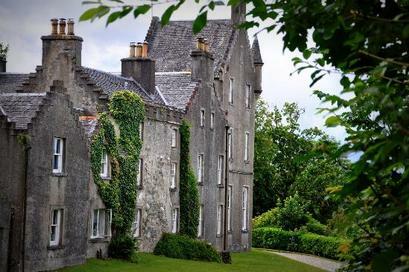 group will have exclusive use of a charming Scottish seaside castle for 6 nights. Originally built in the 1500s, Lunga House is located in a remote area on the west coast and enjoys spectacular sea views stretching across to the Isle of Mull. While we’re ensconced at our very own “little castle with a big heart,” Gerard will teach three writing workshops and will also host a one-on-one session with all writers. These private coaching sessions are focused solely on you and your writing – Gerard will provide detailed feedback on the writing sample you send ahead of time, and it’s a great opportunity to talk about your writing goals and come up with strategies to meet them. When you’re not writing, you’re free to explore the nooks and crannies of Lunga House or take a horseback ride at the Lunga Riding Stables, right on the Lunga Estate. Enjoy stunning ocean views looking over the isles of Jura and Scarba, as well as hilly forest treks, with opportunities to ride across open hills for more experienced riders. A 10-minute walk down the road takes you to the village of Craobh Haven where you’ll find a grocery store, a craft and coffee shop, and boat trips and yacht charters are available from here. The Lord of the Isles Pub> serves great bar meals and has an excellent restaurant, and often has live music. The windows and patio overlook the Marina and boats and are an excellent place to sit and watch the world go by. Having the run of Lunga House means we can host our group readings where we please, when we please. The castle will be filled with other writers who understand the need for space and quiet, but if you want the company of other writers, there will also be many opportunities for socializing – Gerard encourages a balance of time spent in the company of other writers and time alone dedicated to your own writing. Besides the workshops, he prepares individual writing prompts, and as your writer in residence, Gerard is available for consultation throughout the 12-day retreat. The next leg of our journey takes us up into the Scottish Highlands to Inverness, with stops at Spean Bridge and Commando Memorial. We’ll also explore Loch Ness and Urquhart Castle before we land at Kingsmills Hotel, our home for the next three nights. We’ll then take a full day tour of the Isle of Skye, where we’ll see the historic Eilean Donan Castle and experience the jaw-dropping wonder of this incredible island before returning to a final night at the Kingsmills Hotel in Inverness. In the morning, we leave the Highlands and head south, via the famous Cairngorms National Park – also seen in Outlander – on to Perthshire and the quintessential Highland towns of Pitlochry and Dunkeld; finally, we’ll cross the Firth of Forth as we make our way into Edinburgh proper and the Bonham Hotel, the last hotel on our Scottish journey. While in Edinburgh, we’ll visit Edinburgh Castle and join the Book Lovers Tour to visit the haunts of Edinburgh’s literary legends, including Arthur Conan Doyle, Robert Louis Stevenson, Ian Rankin, and J.K.Rowling. On our final day, you can explore Edinburgh on your own, or take a day trip to The Kelpies, Stirling Castle, and Doune Castle of Outlander fame, a.k.a. 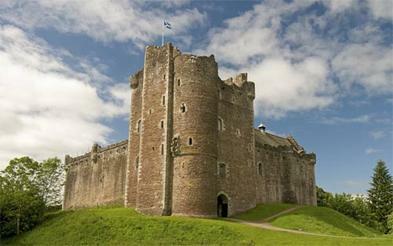 “Castle Leoch.” Then it’s back to the Bonham for our last night together before the end of the retreat.